Sharon is a native Texan who was raised in a loving home and close to lots of family. She graduated from Lamar University and worked in banking management for over twenty-one years and became the Director of Banking Operations, specializing in systems management, acquisitions and fraud prevention. Sharon left banking in 2002 to focus on her family and later assisted a friend in the vacuum coatings industry. In 2008, Sharon joined the staff of Mont Belvieu’s First Baptist Church as the church administrator and treasurer. Sharon met and married her husband, Ron, while in college. They have two adult daughters, Jamie and Angela, who attend college. She and her family have been members of FBCMB since they moved to the community in 1994. Ron serves as a deacon. Together they have served as Sunday School teachers for children two to eighteen and led adult small groups. In her spare time, Sharon enjoys good movies, reading, racquetball, sudoku puzzles, and great comedians. Thomas has been going to FBCMB for over seven years and has been staffed as a bi-vocational Pastoral Assistant since Oct 1, 2014. 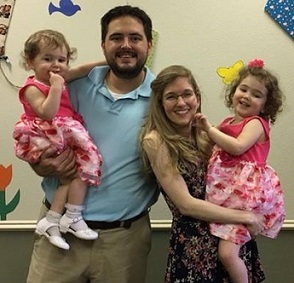 Before coming to FBCMB, Thomas served as Sunday School teacher for both youth and adults, been a youth and pastoral intern, and has gone on mission trips to spread the Gospel. Thomas is married to Leslie, and they have two daughters, Natalie and Jordan. Some of Thomas’ passions are encouraging God’s people to grow in discipleship, studying God’s Word, and preaching. Thomas enjoys spending time with family and friends, watching football, going to the movies, reading, playing board games, and playing Golf.